There is no doubting that the landscape and natural wonder of Iceland is second-to-none as some of the most beautiful on Earth. 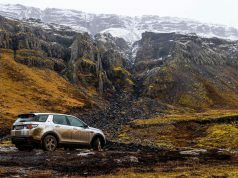 Every popular attraction along the Ring Road, the Golden Circle, and the Snæfellsnes Peninsula are must-sees from our experiences. In that same vein, there are some experiences that stick out as far more overrated than others. Conversely, others stick out as being highly underrated. 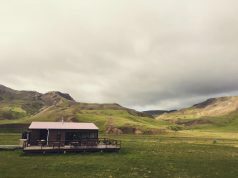 On our eight-day Icelandic journey, we agreed on three specifically overrated Icelandic attractions, and three other incredible natural wonders we wish we could have spent far more time exploring. Interestingly enough, the volume of tourists was a direct affect of all three itinerary stops on both lists. So let’s hop to it! Strokkur was by far the most underwhelming of all Icelandic activities we experienced on our incredible eight-day journey. Strokkur was still immensely impressive for what it was: massive bursts of boiling water shooting 100 feet into the air at random intervals. 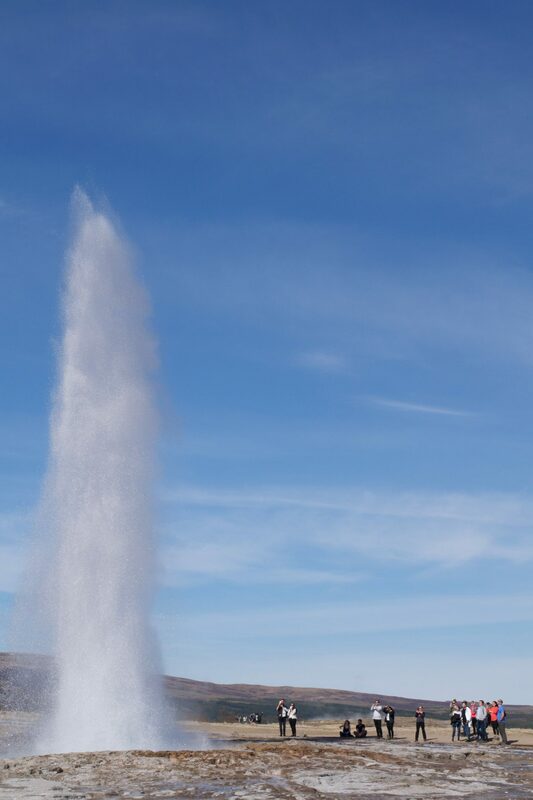 However, the combination of having been on the road for six days without a ton of tourist interaction, with standing in a large circle with hundreds of other brightly-jacketed, impatient tourists waiting for a geyser to explode led us not to be incredibly impressed with the result. Perhaps we were spoiled by the seclusion of the previous week. Maybe we had just arrived at a point in time where day trips from the capital were becoming more common (early May). Regardless of the case, the entirety of the Golden Circle was jam packed with tourists from around the world all doing the same thing we were. Don’t get me wrong; we were both extremely self-aware of the fact that we were two of those tourists mentioned above. Maybe it was just the comparison between what we had been doing in previous days (hiking, adventures, waterfalls, cliffsides, etc.) to standing in a circle watching a hole in the hot ground. In the end, we stayed around for three iterations of Strokkur’s eruptions. The first one occurred while we were walking towards the geyser. The second as we were standing around, but it happened at such an odd interval we were unable to get our cameras out in time. The third eruption we captured in the image above. Within seconds it became water vapor and disappeared. Overall, while we enjoyed experiencing Strokkur (Geysir is currently relatively inactive, erupting extremely rarely compared to Strokkur’s every-several-minutes eruption intervals), we would consider the Golden Circle staple attraction to be highly overrated, far more so than its counterparts Thingvellir National Park, Gulfoss, and Kerid Crater Lake. On our very first full day in Iceland (after landing at 6:45 am that morning following an all-night flight from New York City), we enjoyed such wonders as Urridafoss, Seljalandsfoss, and Skogafoss. Eventually, we headed towards the Icelandair Hotel Vik for the evening, exhausted from our travels and lack of sleep. As we drove, we noticed a large parking lot that was about half full on the right. In the distance, we saw the ocean, and we assumed that this was the car park to see the “black beach” we had heard so much about. I estimated the distance as a half mile, so we decided we could do that and parked and started walking. After a mile of walking in 30 mph winds and frigid temperatures with zero change in landscape, we didn’t appear to be getting any closer to the beach. We had passed a few people who were walking in the same direction and had passed a few more that were walking back to the parking lot looking extremely tired. It was at this point that it clicked for me that we were walking towards the Solheimasandur Plane Wreck scene. We walked for two and a half miles in one direction, with zero scenery changes outside the occasional human-made rock cairn, before we arrived at the wreckage of the US Navy plane. It was crawling with brightly-jacketed tourists as seen above. People were crawling on top of the plane, inside the fuselage, and into the cockpit, hanging off the wings, and more. These were grown adults jumping all over a 45-year-old tourism staple in the southern coast of Iceland. They were doing it for the pictures obviously, and I managed to snap a few from strange angles without any bright jackets in them or people crawling over the wreckage. We left the area and spent another 45 minutes walking the two and a half miles back to the car, and were relatively disappointed. I had read online that this attraction was a must-see back when it was drivable, but ever since the landowner stopped all but foot traffic the time and energy expense wasn’t worth the trek. Would we have braved the walk again if we had done it earlier on a day where we had gotten solid sleep before? Maybe. Would we have taken the hike to the wreckage if we would have known at the start where we were walking and what the distance would have been? Likely not on that day for sure, but possibly the next day. 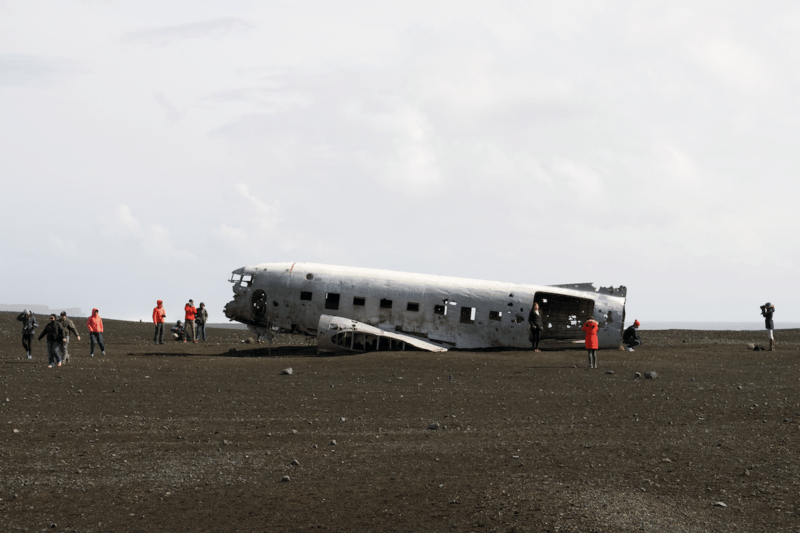 Overall, is the Solheimasandur Plane Wreck overrated? To us, most definitely under the conditions we were dealt. But it sure was incredible to see the wreckage of a plane crash in its natural habitat! Most will disagree with this sentiment. Those who either visited the beautiful Myvatn Nature Baths or traveled the full Ring Road would likely agree with me. I have seen many blog posts in agreement that the Blue Lagoon is the Disney World of Iceland, and after experiencing it myself, I completely agree. Again, as with Strokkur and the Solheimasandur Plane Wreck, the Blue Lagoon was one of those Icelandic bucket list items that needed to be crossed off. Spending over a week in Iceland, seeing well over 100 amazing sights over eight full days, and not visiting the Blue Lagoon would have been almost sacrilegious. So, of course, we made sure to book in advance, and sprung for the Premium package for our excursion out of Reykjavik on our last day in Iceland. The Premium tickets (10,200 ISK each), included a mud mask, algae mask, a free drink, a towel, bathrobe, and slippers. Halfway through our trip, we were in Myvatn and spent a good hour and a half at the Myvatn Nature Baths after an eleven hour driving day. We compared and contrasted the pros and cons of these two geothermal spas in our post Myvatn Nature Baths vs. The Blue Lagoon: Pros and Cons. The Blue Lagoon was legitimately our last excursion of our adventure, and while it was a nice, relaxing close to an exhilarating and action-packed journey, we were apprehensive of the crowds from the get go. We arrived to find the parking lot relatively full. Our reservation time was set at 2:30 pm, and we had put in a reservation for Lava Restaurant at 5:30 pm. After only spending an hour inside the actual spa in Myvatn, we realized that between the long span of time between arrival and reservation, and the ridiculously high prices of Lava, we would likely be skipping that reservation and instead opting for a smaller dinner experience in Reykjavik. The entrance area is a long walkway with natural lava rock walls on either side. Quite a few people were walking back and forth with their luggage, as Blue Lagoon is a popular destination once short-term travelers land at Keflavik International Airport. Once inside we are greeted with a super-overpriced gift shop and a modern-looking check in area akin to a hotel. Once signed in, we received a waterproof digital armband that allowed us to lock and unlock lockers, as well as purchase amenities and drinks once in the water. We undressed and showered and changed and then met up in the extremely crowded deck area. 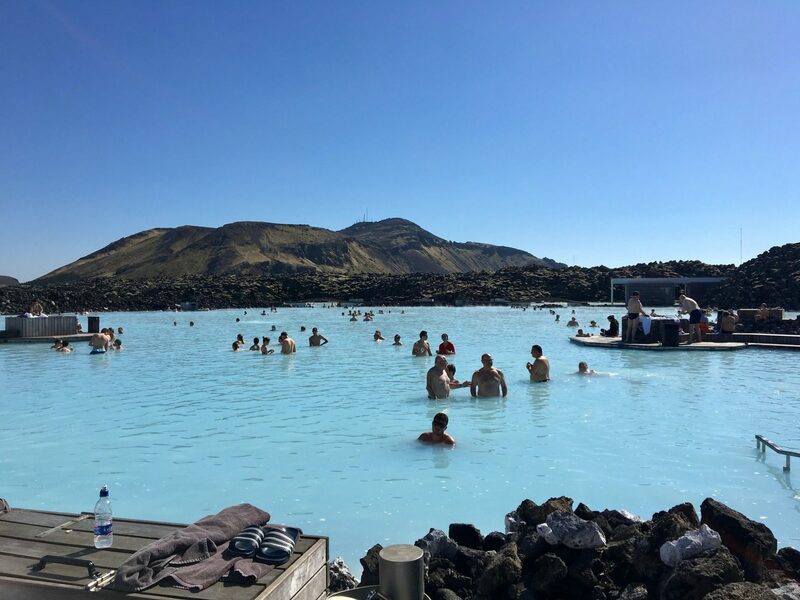 While far larger than the Myvatn Nature Baths, Blue Lagoon is also far more crowded, with a less sought-after landscape and a non-natural pool made blue with silica instead of sulfur (so the sulfur smell was not as powerful). We hung out and enjoyed the scenery for a few minutes before entering the water. We then were approached by a staff member in the water who gave us the mud mask, which we applied and waded about. We headed to the bar and got our free drinks and then walked the perimeter of the lagoon, washed off the mud mask and got the algae mask, then went under the bridge and explored some more. I’m sure some of it was due to the exhaustion from the long trip, or depression knowing we had to fly out early the following morning and leave this beautiful country, but we only lasted about and hour and fifteen minutes at the Blue Lagoon before we decided to head back to the locker rooms, change and escape. While still a great, once-or-twice-in-a-lifetime experience, the Blue Lagoon was very much overrated as one of the “best things to do in Iceland” and one of the “25 wonders of the world”. We were of the impression that the experience of Dyrhólaey would be parking, walking quickly to the Dyrhólaey Arch, taking a few pictures, enjoying the view, and then heading back to the car. Words cannot express how wrong we were. Once we parked (there were maybe two other cars in the lot at 8:30 am), we could hear violent waves crashing in the distance (it was very cold, foggy, and was raining a bit). We also saw multiple paths leading off in many directions. 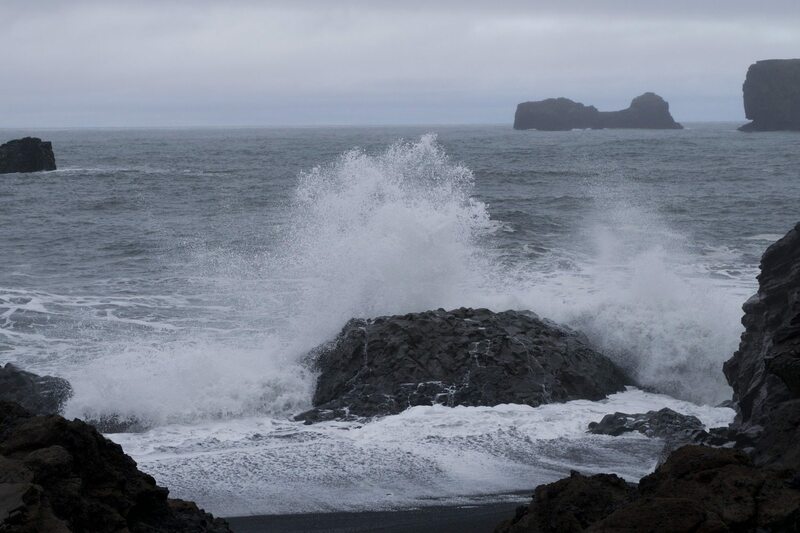 We decided to go left first, walking alongside a cordoned off cliff face and watching the incredible power of the waves crashing on the lava rock and black sand beaches. After this, we trekked back to the car, noticing that the parking lot car count had doubled. We stopped at a red and yellow warning sign, letting us know that the area was hazardous ahead, and not to venture further. Past the sign was an alcove that appeared to be the calmest section of the Dyrhólaey beachfront area. Waves were still lapping on the shore, and the white foam arriving and receding was a stark contrast to the pitch black lava sand. We went to the left of the sign and walked straight ahead up a small hill to a beautiful overlook. Beside this lava rock was an intricate lava rock arch, where every 20 seconds or so, a wave would crash upwards through the archway, splashing water up into the air like a water cannon. To be honest, I enjoyed this more than Strokkur. It was one of the most surreal experiences of our vacation. After taking some pictures and videos at this overlook and soaking in the scenery, we ventured to the right, up to a path bordered by small lava rocks leading up a large hillside. We hiked for about a mile and a half before passing a tourist going the opposite direction back down the hill. The whole time we bordered the cliffs, and in the distance could see the orange and white lighthouse of Dyrhólaey. When turning, we could see the full view of the crashing waves, even through the thick fog. We eventually made it to the Dyrhólaey Arch. The arch was massive, with thousands of birds nesting on its cliffs. Further up, more tourists began filtering from a tour bus that had arrived from Reykjavik (so said the side of the bus). At the top of the hike was the lighthouse in all its splendor. Off in the distance laid miles and miles of untouched black beach hundreds of feet below where we stood. Several miles out was the plane wreckage mentioned earlier. Unfortunately, tourists were crossing the barriers to get as close to the cliffside as possible, tramping on all the grass and foliage. The way back down was relatively treacherous as far as our Iceland experience had been thus far. Loose lava rock mixed with rain and a steep downhill led to a slow descent back to the Subaru. Overall, what I thought would be fifteen minutes or so of exploring had quickly turned into a two and a half hour excursion. I see plenty online regarding the arch, but not much else about the other incredible sights at Dyrhólaey, making this one of the top three most underrated attractions we experienced on our trip. 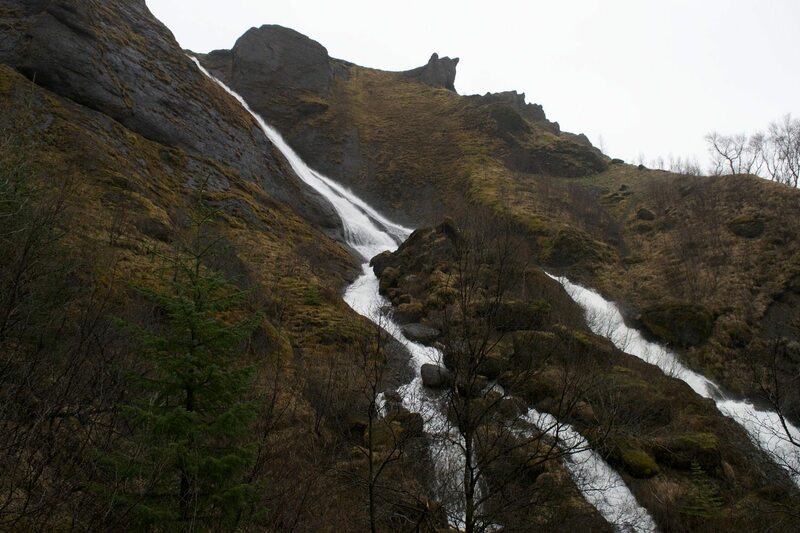 Systrafoss is a large, swooping double waterfall that is generally running slowly or completely dried up. Luckily, we had been experiencing a few days of off and on heavy rains through the south coast of Iceland, so when we arrived things were flowing beautifully, as could be seen from the parking area in the small town of Systrastapi. We hiked up a small, wet hill and immediately found ourselves surrounded by trees, which was an interesting difference compared to the scenery of our past few days. At the top of the small hit we swung right, and ducked behind a massive boulder. There we were face to face with the beautiful dual waterfall (“Systrafoss” is Icelandic for “sister falls”). A network of hiking trails ran back in several directions past the waterfall, outlined with green, red, and yellow blazes. Systrafoss is the only area directly off Iceland’s Ring Road where travelers can hike within tree-topped forests. We took the green blaze trail, as it seemed to be the most sheltered from the elements (it was raining steadily by this point in our day). On the trail, about a half mile hike from Systrafoss, we stumbled upon a tree that had a sign stapled to it with words in Icelandic. Beneath the words was a notice in English that the tree was the unofficial “tallest tree in Iceland”, so that was a nice easter egg to find. We took the yellow blaze trail from here, which led to the top of a steep staircase with a cliff face on one side and a sheer cliff with trees on the other. Eventually, the rain grew heavier, and the trail became narrow and very slippery, so after getting a nice view a little past the top of the staircase we retreated back to the car to retire for the evening. The following day, we backtracked and continued down the Ring Road back to Systrastapi. We passed the turnoff for Systrafoss, and instead turned left at the traffic circle towards the small Systrastapi waterfall. This was the third straight day of solid rains, so the waterfall was flowing far stronger than any of the images I had seen in my itinerary research. The waterfall is a small drop in the middle of a stream, mainly comprised of water flowing over a massive round rock. The Systrastapi waterfall was one of the smallest ones on our journey, yet it was the first waterfall we experienced where we were the only people there. The falls themselves were absolutely gorgeous, even against the dull brown early May landscape. Systrastapi’s waterfall was located right off of Road 203, with a small parking lot, back about 1500 feet but visible from the road. You walk alongside a stream, and can get closer to the falls than most other easily-reachable falls in Iceland. If you are brave enough to enter the cold water, and the weather works for you, the falls can definitely be waded directly into for a quick shower! If you look to the right on the way to the falls, you can see some large boulders that have rolled down the mountainside due to the winds and weather, their paths through the hillside visible. This was my favorite activity in all of our Icelandic journey. It was about ten minutes from the Snaefellsnes Visitor’s Center. As with most of our trip along the peninsula, there was thick fog present upon our arrival. I hadn’t done much research on this gorge before our trip, so I was unsure as to what to expect. We appeared to be looking at a solid cliff face about 500 feet high though when we arrived at the parking lot. There was a river to the left that was about 15 feet wide and in a ravine. 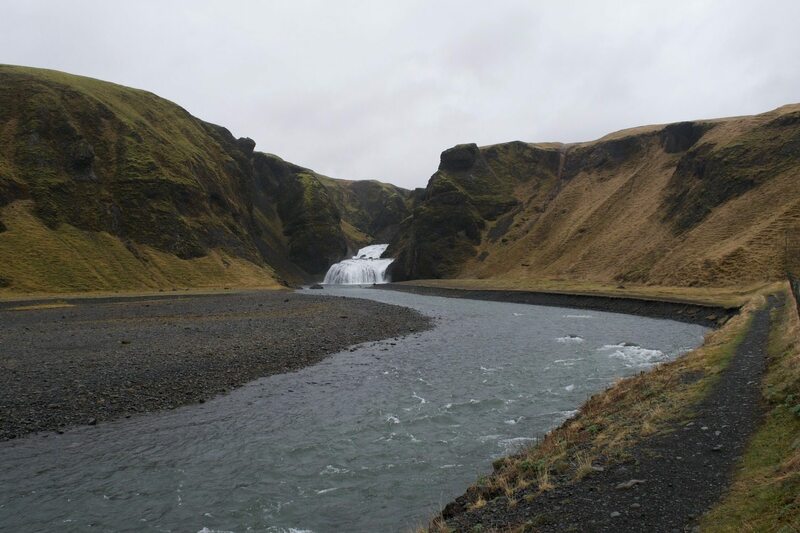 At first, I was under the impression that the river and ravine were the Rauðfeldsgjá Gorge. When we started walking closer to the cliff, we realized what we were walking towards. There was a small fissure in the cliff face that opened up into a massive canyon hundreds of feet high. A man was climbing up a grassy hill directly in front of the gorge fissure, and looked like a tiny speck against the landscape. He was the only one at the Rauðfeldsgjá Gorge, left before we reached the inside of the gorge, and only one other family arrived, showing up when we returned to the car. As we continued walking towards the gorge, hundreds and hundreds of birds could be seen and heard circling overhead. The gorge was maybe five feet wide at the base, and opened up to probably 40 or 50 feet wide at the top. It was basically a large cave with an open top. The river took the width of the base opening, so we stepped from rock to rock to enter the gorge itself. 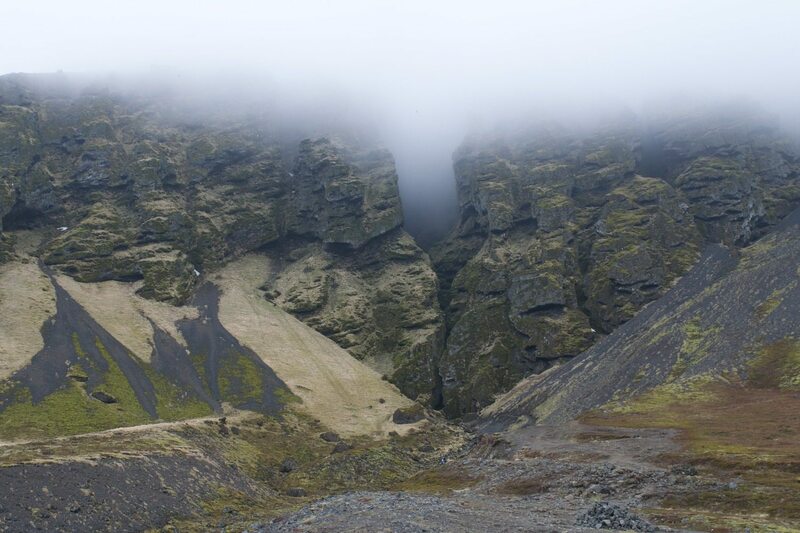 The image above is a skewed vertical panorama of what the Rauðfeldsgjá Gorge looks like from the inside, after stepping across some stones to get inside. The cacophony of one thousand birds echoed down. Everything was damp and mossy. To the right was a nice area to stand and take it all in. To the left the river continued. If the water level was lower and it had not been raining heavily the entire week, we would have continued, as there is a small waterfall with a climbing rope further upstream. Looking outwards from the entrance of the gorge, the view was incredible, even with the settling fog. We had the place to ourselves at that point, and spent some time exploring. In the distance from the gorge entrance looking towards the parking area (about 1/3 mile away), the ocean and waves crashing could be seen. This natural wonder, which we had low hopes for upon our arrival, ended up being the most underrated, incredible experience of our vacation. 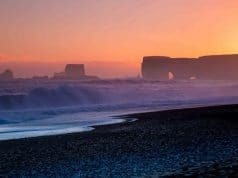 Iceland in 8 Days is the most comprehensive eight-day itinerary to Iceland, with travel tips, tricks, and secrets you won't find anywhere else!